The allowance is not payable in respect of horses that win prize money of €3,000 or more in a Group race or €1,500 or more in a Listed race. Berlin is well served with international flights from all destinations. Since 2015 a horse trained abroad can now be entered in any handicap if it has won a flat race either in the current year or in the year before. Horses trained in Scandinavia will receive an automatic allowance of 2 kg (4&nbsp;1/2&nbsp;lbs) off their national handicap. Please note that there is no maximum weight in handicaps under the German Rules of Racing. Supplementary entries for all races can be made on the day of the Declaration to Run. The supplementary entry fees are as follows. For all Group races the supplementary entry fee is 10% of the prize money for the race. For all other races the supplementary entry fee is 175% of the total stakes. Hoppegarten boasts a galloping and fair turf track measuring 2350m (just under 12 furlongs) in circumference. The run in measures 550m (just under three furlongs) with a slightly uphill finish. 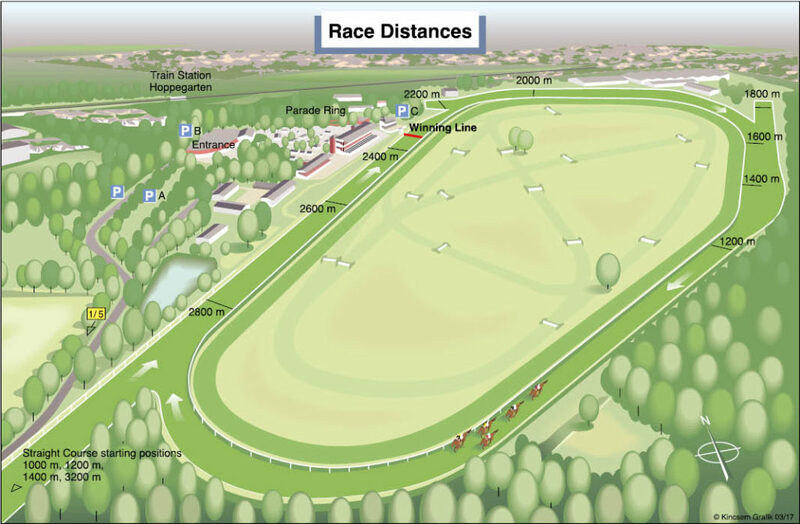 Hoppegarten also has Germany’s only 1400m (7 furlongs) straight course. Both tracks are 30 meters wide. Built on sandy subsoil, the tracks drains well and enjoys the benefit of a modern watering system. Consequently, extreme ground conditions are rare.